We’re all in search of that perfect straight edge, that golden selvedge, and there are many ways we get there. We employ special threadings, floating selvedges, denser edges. You can use regular shuttles, open bottom shuttles, end feed shuttles or temples to aid you in your selvedge journey. A good selvedge shouldn’t be hard to find. 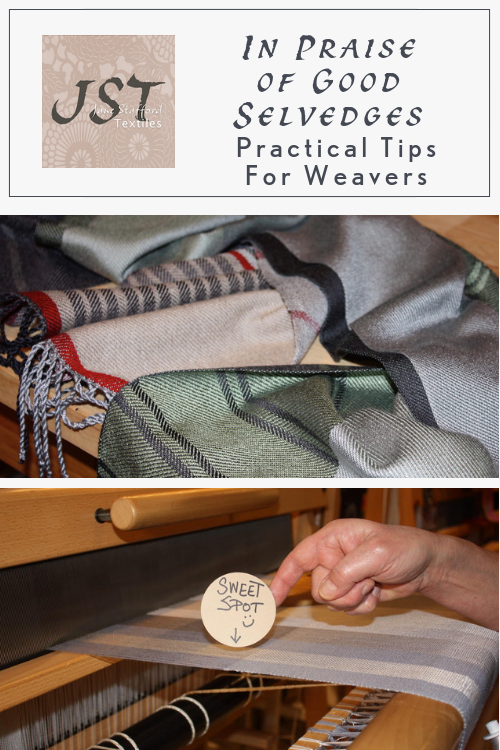 I have trained a lot of weavers over the years, and selvedges are always (cough) on the table. Over the years, I have come to feel that some of the thoughts below are quite important, so I’m sharing them with you today. Thought #1: The loom is my instrument! 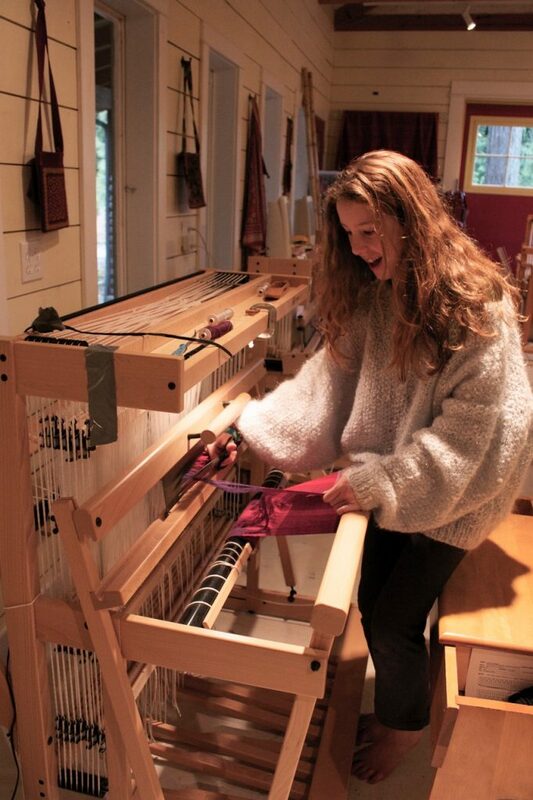 I always tell people that the loom is my instrument…it is my version of a violin. The shuttle is my bow and the cloth is my music. Any string musician will tell you that their bow needs to feel good in their hand, and so my shuttle needs to feel good in my hand too. 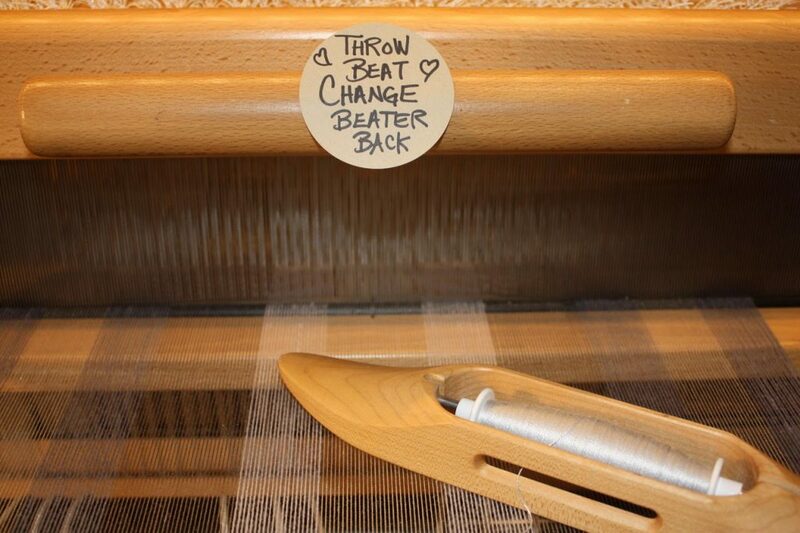 My favourite “bow” is the Schacht open bottom shuttle, because it allows me to tension my bobbin from underneath each time I handle the shuttle. 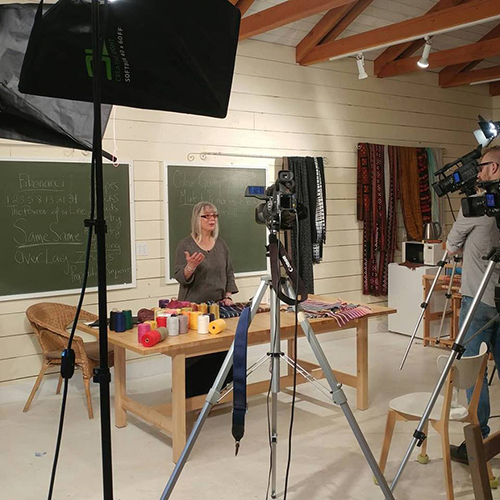 My shuttle fits my hand perfectly—it is not too big or too small—and I use the same shuttles for all my weaving. Thought #2: Bigger isn’t necessarily better! 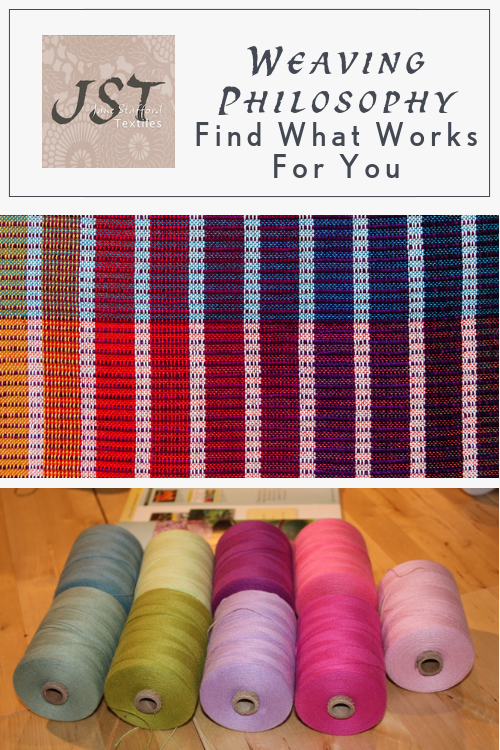 Sometimes we weave with thin yarns, sometimes we weave with heavier—and when we do we think we need to change the size of our bobbins in regards to the size of the yarn. 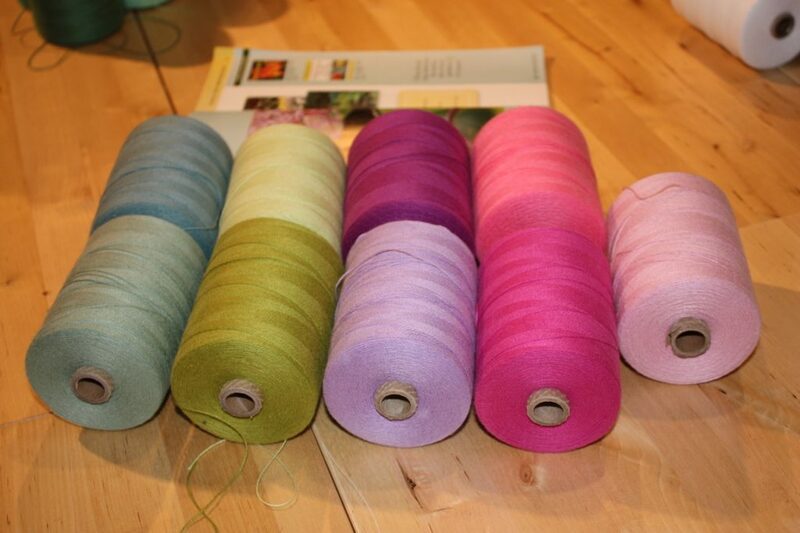 If we use a bigger bobbin we can get more yarn on it and therefore weave for a lot longer. The choice of a longer bobbin necessitates the need for a longer and larger shuttle. Bobbin lengths increase by 1″ of length. When you stop to figure out just how much more yarn you can get on that 1″ longer bobbin, you will be surprised to find out that the answer is “Not Much”. However, you now have to put that bobbin in a shuttle that is 2″ longer than your favourite regular shuttle which fits your hand like a glove. A 4″ bobbin (the regular kind) fits an 11″ shuttle, 5″ bobbins fit a 13″ shuttle, 6″ bobbins fit a 15″ shuttle. (I’m glad they don’t make longer bobbins because then we would be wielding lengths of 2×4.) 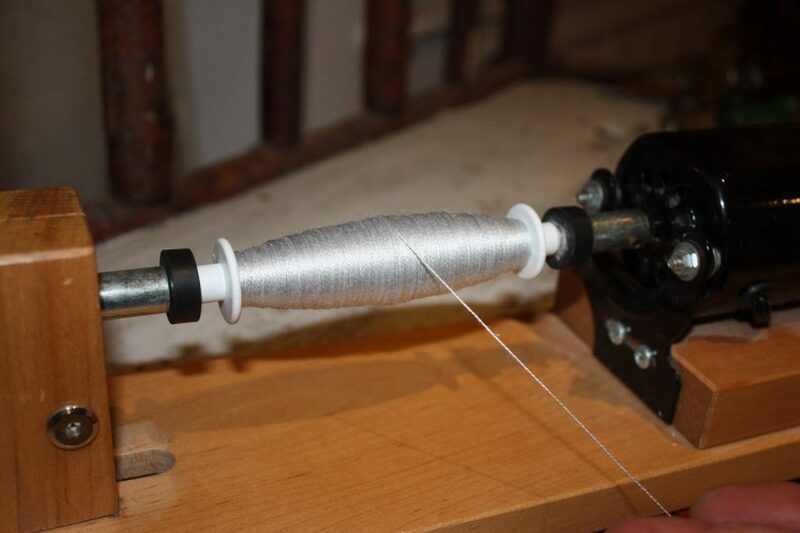 Any advantages we gained from those 1″ increases in bigger bobbin size are quickly and dramatically lost because now our “bow” doesn’t fit our hand as well and we can lose control of our technique. Thought #3. Sequence of events. When you beat on an open shed, you allow the shed to take what the shed requires. The beater actually pulls yarn off the bobbin and into the shed. It stops when the beater touches the fell of the cloth and it has taken just the right amount. 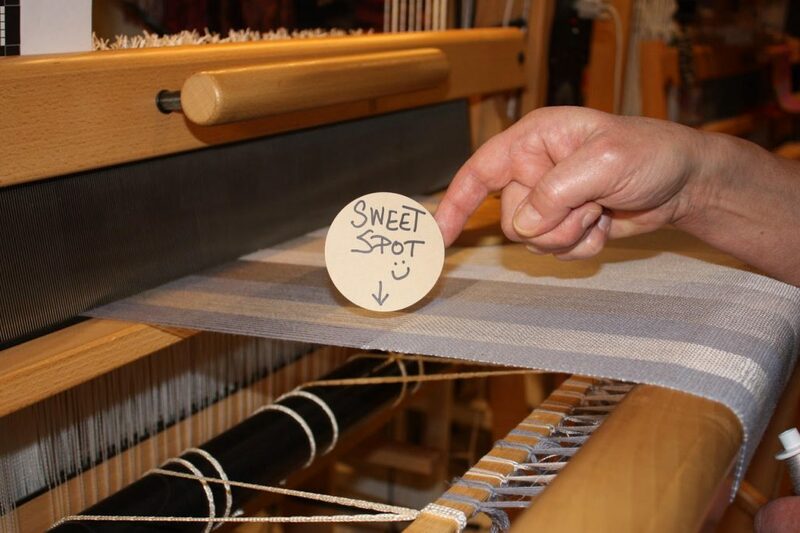 When we consider the alternate way of beating in a weft yarn (which is to bubble and beat on a closed shed), we have created a closed situation where you must create the same scenario exactly the same way each time you throw the shuttle—and that is a very difficult thing to do. If your bubble is too high, then the excess yarn squishes out the side at the selvedge. If your bubble is too low then there isn’t enough yarn in the bubble to fit the shed and your selvedges draw in. Try the method above and see how this little sequence solves so many selvedge problems. Thought #4: Wind a good bobbin! I know that everyone reading this will have had this experience. You are weaving away and you get towards the end of your bobbin and the yarn on your bobbin starts to jam up. When this happens all of our focus is on that stupid bobbin and yarn not coming off, but as we tug and pull we aren’t paying much attention to the fact the other selvedge is being tugged and pulled. One of the reasons your yarn is stuck is because you filled the corners of the bobbin when you first started winding it and those corners have now collapsed like a mountain slide of scree—I know! I know! We are all taught to do this. It’s in every book you open. Here is an alternate approach. It provides you with a situation where the yarn is able to leave the bobbin freely, right down to the last inch. Once upon a time, before there were plastic bobbins with ends bits there was the paper quill. Paper quills were wound with a firm straight movement from side to side, slowing moving away from the edges and winding closer to the centre with each pass. Now, I love plastic bobbins with end bits, but I wind them the old fashioned way, like a paper quill. You wind straight across from side to side, filling up the bobbin until it is half full, then with each successive pass I come a little closer to the centre creating a ‘sausage’ shape. As the bobbin fills, you stay away from the sides and you wind them firmly with your fingers, guiding the yarn onto the bobbin, right up close where you have the most control. Thought #5: Find the Sweet Spot! 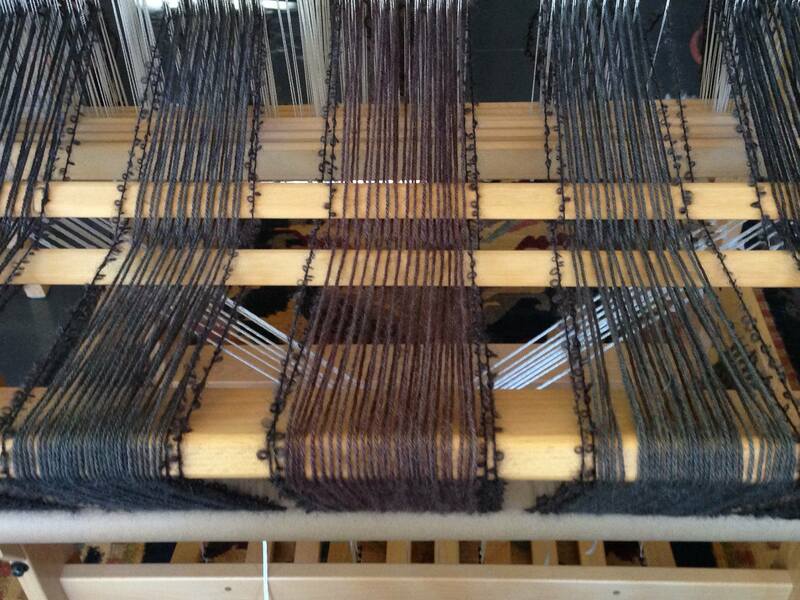 It is so tempting to weave just a little further before we advance the warp. We all do this, but it is a bad habit and it is a habit that is detrimental to your selvedge. When you weave too close to the beater you force your warp into a situation where it has to open its mouth too wide. It is yawning, and when it yawns, it pulls on the weft yarns at the selvedge. You don’t notice this until you advance your warp and then you go—oh heck—look at that. My selvedges are messed up, it must be the tension on my warp, or maybe it is the yarn I’m using that is slippery or heck, it must be the stupid loom’s fault……WRONG! It’s a bad habit. 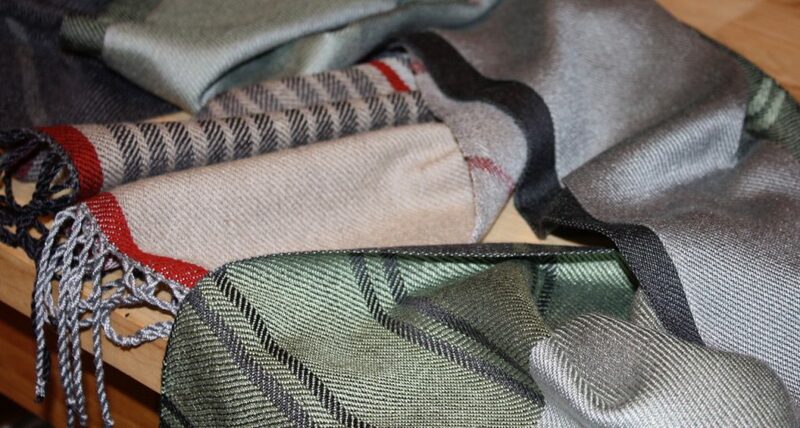 If you get into the good habit of advancing your warp frequently you won’t be putting your warp into that stressful situation which makes your weft sloppy at the selvedge. SO CUT IT OUT already! Weave in the sweet spot…..that perfect little space in the middle where Goldilocks lives and everything is juussst right! Now I don’t mean to be boastful and all, but if I may say so, I do know how to get perfect selvedges. People compliment me on my selvedges all the time. They might think I need a good haircut or some new shoes, but I always get the nod on my selvedges. I have never used a temple in my life. I appreciate their role in rug weaving and ikat weaving, but for the general run-of-the-mill type weaving that I do, they simply aren’t necessary. The temple’s main purpose is to prevent draw-in. 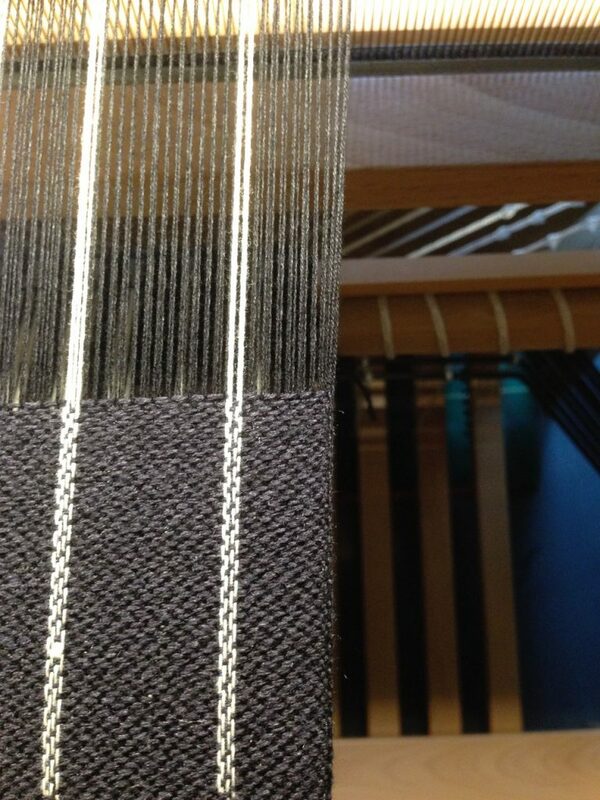 Now, I think that a little bit of draw-in is desirable—and necessary to aid in even weaving…selvedge to selvedge. A little bit of draw-in is like having good firm walls holding up the roof of your house. Your selvedges are the walls of your cloth and the rest of the warp is the interior studs. Your weft is the floor of your house. Your beginning hemstitching is the basement, strong and tight for you to build on. I don’t use floating selvedges unless I absolutely have to, like in a twill. (Or in a basket weave or canvas weave—these two weave structures both have two picks in the same shed.) With some weave structures you do need to employ different threadings to make the selvedge structurally secure, but in most weaving you don’t need to do anything except use your good shuttle handling technique, a proper throwing sequence, good bobbin winding skills, and diligent warp advancement to get those great selvedges. Thought #7: Sibling Rivalry at the Edge! 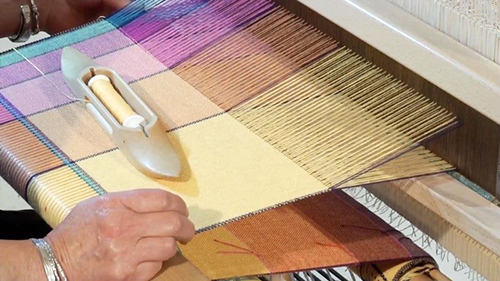 One side of your weaving is often better than the other—and it is usually the side opposite your dominant hand. So, right-handed weavers often have a better left selvedge, and left-handed weavers often have a better right selvedge. The reason is, your dominant hand is often more confident and has greater control as compared to its non-dominant sibling. So, your right hand is controlling the left selvedge, and the left hand is controlling the right selvedge. (This is, of course, not always the case, but it often is.) If you want to get both selvedges the same, you need to pay careful attention to your hands, to see if one is doing something in some way different from the other. Maybe it is a little wrist action before you throw your next shot. Or maybe your finger sits differently on the bobbin on one side and not on the other. Your job is to patiently and quietly pay attention to what the good hand is doing, and try to send that—knowledge—to your other hand. Remember that your mind is controlling the whole show. Thought #8: What should I be looking at? When I weave, my eyes are moving back and forth between three different spots. When the shuttle hits my right hand, my eye is watching the left selvedge. That’s because the right hand is controlling the tension on that left selvedge. Just before the shuttle heads to the left I give the shuttle a teeny weeny little tug. My finger works like a brake on the bobbin and this little tug pulls out any sloppiness that might be at the edge as the weft yarn turns the corner. While my shuttle travels across to my left hand, my eye is focused on that right side. Then my eye goes to centre again to watch what the beater is doing. In general, I don’t fart around with the selvedges, manhandling them with every pick. It is all done through controlling the yarn on the bobbin and controlling the shuttle with our hands— the most wondrous tools we have. Thought #9: Pass the torch! When I put a shuttle into any new weaver’s hand for the first time, I am mindful of how I do it. If you teach someone good technique right from the start, you are giving them one of the greatest gifts you can. We all know how hard it is to change bad habits. 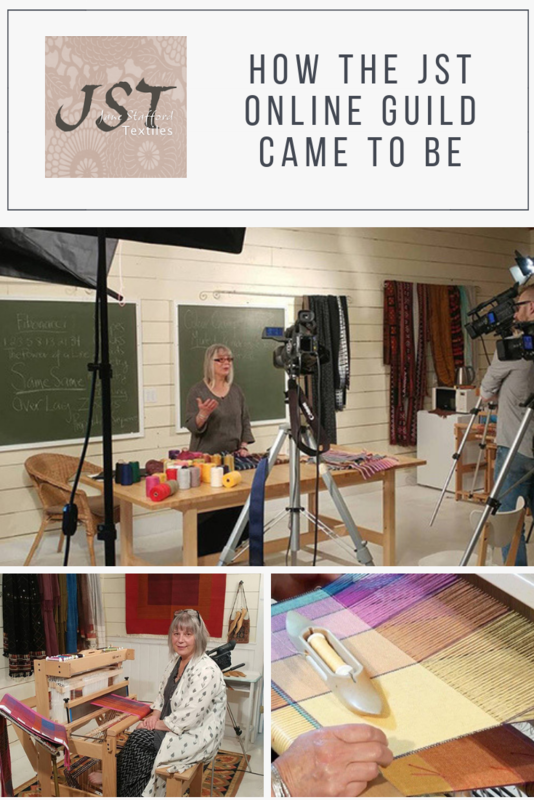 If you learn to weave with bad technique—well, changing it later on can be quite difficult. Palms to the sky! Hold your shuttle with your palms up. That is what I always say to my students. Use the shuttle that fits your hand well and feels good, because you will be more confident with it. Go slowly at first, gain confidence, and then bring up your speed. If you start to lose control, slow down until you find your comfort zone again. It is just like driving a car. This is Molly who used to work here after school when she was in grade 8. If you start with a good warp AND wind a good bobbin AND Weave Intentionally AND pay attention to sequence—you will have good selvedges—without the need of extra tools, expensive shuttles, or pirns. If I can get great selvedges out of a seven-year-old student within an hour, you can have good selvedges too. The easiest way to get there is to practice. Put on a narrow warp, about 12″ wide, with yarn that you have no to emotional attachment to and that you aren’t planning to give away as a present and try some of the techniques above. By the end of that warp your selvedges should be perfect! 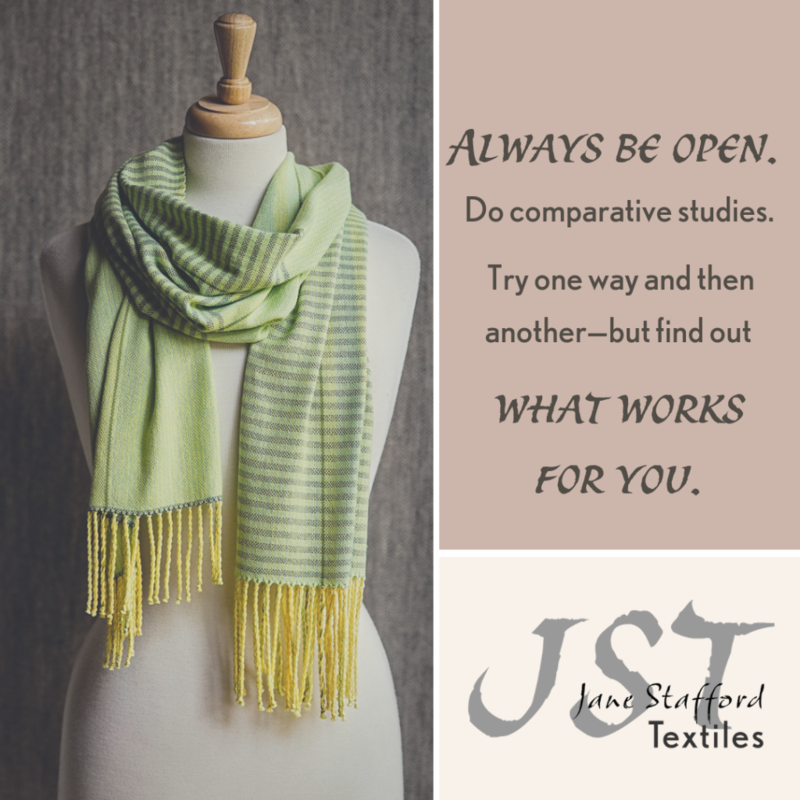 For more great weaving tips from Jane, click here to sign up for our monthly newsletter. You’ll also receive a free PDF download of Project Planning 101: A Weaver’s Toolkit!